The ultimate goal of every business is to maximize profits and to achieve that it should have growth strategies. 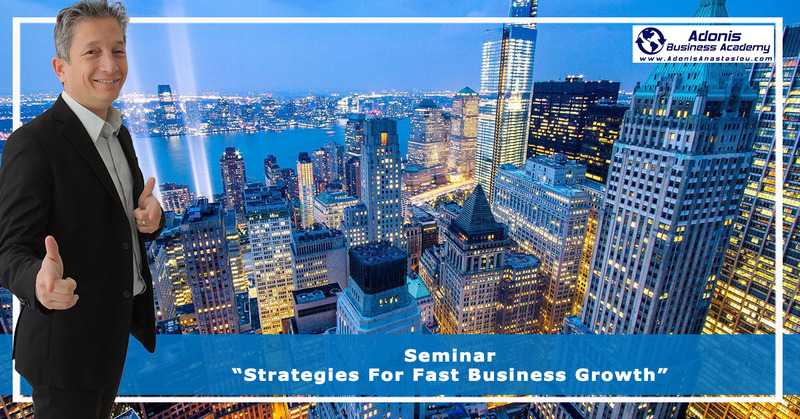 This workshop will reveal to the business owners and managers the strategies that they should apply in order to achieve fast business growth, increase their sales and increase their market share in local and global markets. • To know the different growth strategies. • To apply the blue ocean strategy where there is no competition. • To know how to apply innovation in their businesses. • To set a clear vision, mission and goals. • To craft a growth strategy with the aim of business development. • To implement successfully those strategies. • To improve the processes of their business in a way to improve effectiveness and reduce expenses. • To document their know-how in an operational manual as a way to improve quality and profitability. • To set Key Performance Indicators (KPI’s) for their company and for each employee. To develop and monitor high performance teams. • To apply systems for maximizing sales. • To apply strategies for promoting their products and services. • To have a positive attitude towards fast business growth. • To motivate the rest of the management team to increase their productivity so that the company achieve its overall goals. • For those who would like lunch there is an additional cost of €30+V.A.T. Due to a limited number of seats available you have to do your registration in advance. You can buy your ticket at the bottom of this page. • Unemployed, self-employed and government officials are not eligible for the subsidy but we have a special offer for them from €333 to €195 +V.A.T.